Previous post: To YINI and Beyond! Next post: Breathing Buildings presents a CPD seminar for the Merseyside and North Wales CIBSE group in Liverpool. Across the UK construction industry, assessing thermal comfort is a mandatory requirement for all buildings, at the design stage. In the past, when carrying out a building simulation to test the likelihood of overheating, the ‘design summer year’ (DSY) most appropriate to the location of the building would be used as the weather file. 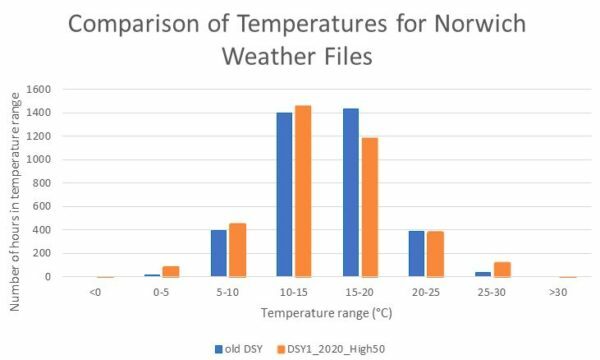 The DSY weather files were selected as the year with the third hottest average temperature between 1st May and 30th September, over the period 1984 – 2004. In the latest revision of BB101,which is due to be released early 2018, the Education and Skills Funding Agency (ESFA) recommends that buildings should be assessed for overheating using dynamic thermal modelling using the recently published CIBSE ‘DSY1 2020 high 50’ weather files. These future weather files are based on the latest climate change predictions, to ensure that the heating, cooling and ventilation strategies for buildings can cope with the expected changes in environmental conditions. It is immediately noticeable that, in the future weather file, there are more hours in the 25-30°C and >30°C brackets. This reflects the fact that the new weather files are based on a high emissions scenario. It is on these warm summer days that a natural ventilation system with a ‘boost’ function would be particularly important. We also notice that there are fewer hours in the 15-20°C bracket – the period most suitable for natural ventilation with opening windows. This is offset by an increase in the number of hours in the 5-10 and 10-15 brackets – the temperatures at which a mixing ventilation system is most suitable. In this temperature range, a mixing system has the advantage of being able to eliminate cold draughts without the need for additional heating (which is required below 5°C), thereby providing major energy saving benefits. This provides strong evidence that, in the future, hybrid ventilation systems will become far more commonplace in the design of new buildings, in place of the more traditional natural ventilation by opening windows.